Tall fescue pasture with Chaparral seedhead suppression. Note the check strip on the right that didn’t receive Chaparral. The author is an extension ruminant nutrition specialist at North Carolina State University. During spring, the growth of cool-season grasses can be explosive and can easily get ahead of a grazier, resulting in a lot of seedhead biomass with low nutritive value. This is especially an issue for tall fescue-based systems because of the alkaloid toxins in the seedheads, but it can also create forage quality problems with other species such as orchardgrass, Kentucky bluegrass, and timothy. Most tall fescue in the central portion of the eastern U.S. is infected by the fungal endophyte, and the seedhead is one of the best sources of the toxins produced. Mature seedheads of any grass are also a possible source of toxin from ergot, which is a fungus that can infect the seedhead, being even more toxic than the fescue endophyte. Seedheads are also low in nutritive value, often being below the requirements of a lactating cow, so they really don’t provide considerable benefit. The key to limiting problems from these seedheads is to not allow them to develop, or at least to limit their development. In most of the cool-season grass species, flowering tillers that produce seedheads are predetermined by spring, and once they are removed very few flowering tillers will develop until the next year. Methods of removing the seedheads are by hay production, early grazing, clipping, or through the chemical seedhead suppression of tall fescue. As you look at your forage system, it is important not to grow a lot of seedheads you don’t need, except in the case of hay production. Cutting in the boot to early bloom stage will result in good-quality hay that will provide excellent nutrition in winter, and also this relatively early cutting date will allow the grasses to make significant vegetative growth before slowing down during the summer. One benefit of taking first cutting hay in fescue-based systems is that a significant amount of the ergot alkaloid toxins are degraded during the curing process. Making haylage in the boot stage is another practice that prevents seedhead production, but be aware that fescue toxins are conserved in haylage systems and might result in a more toxic stored forage than if the crop had been made into dry hay. Clipping a heavy growth of seedheads helps reduce toxin loads on cows, but you need to be aware that it is an expensive and wasteful process to clip a lot of forage you paid to grow but didn’t need for the cows. Reducing fertilization by limiting added nitrogen to only fall applications will help reduce spring seedhead production on most cool-season grasses and will also enhance legume composition assuming soil pH and soil fertility is adequate. 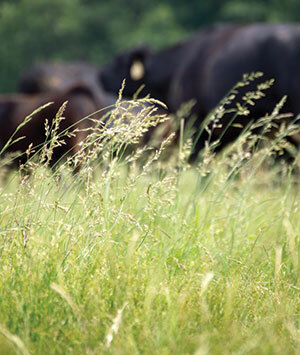 One of the best practices you can do for suppressing seedheads is to turn cattle out a little earlier than usual and move cows rapidly through the pastures during the early growth phases. Well-known grazing consultant Jim Gerrish taught me this years ago, and it really works. The trick is not to graze too short (leave 4 to 6 inches) but rather to move cows quickly and let them eat the boot-stage seedheads. At that point, the seedheads are very palatable to the cows, and in tall fescue the toxin levels will be relatively low. Grazing the seedheads early will allow very significant vegetative regrowth and will result in much better quality forage going into late spring and early summer. Another practice that has been of recent interest in fescue systems is the use of metsulfuron (an herbicide), which has the ability to suppress fescue seedheads. This compound is commercially available in the herbicides Chaparral, Cimmaron, and Cimmaron-Plus. Each of these will work to suppress seedheads, but the most recent research has been with Chaparral, which is a combination of metsulfuron and aminopyralid. Most studies show that Chaparral does a good job suppressing tall fescue seedheads and also controls a lot of common weeds including horsenettle, pigweed, and many other problem pasture weeds. An application of 2 ounces per acre of Chaparral in the boot stage (usually around mid-April along the I-40 corridor) is the recommended practice. If the Chaparral application rate is too high, it can be pretty toxic to fescue. Also, this practice seems to work best when there are other desirable forages such as bluegrass, orchardgrass, and dallisgrass mixed in the stands, which are released when fescue is suppressed. It is important to note that not all weeds are well controlled by an April application of 2 ounces per acre of Chaparral (including hard to kill perennials like blackberry and hemp dogbane). Know what your weed challenges are, and use an additional herbicide application or a different timing of herbicide for control of these other undesirable species. Cows grazing tall fescue seedheads. High toxin loads and low nutritive value limits performance of cows grazing in this kind of situation. At my home farm in southern Virginia, I am challenged with managing a system with a lot of tall fescue. Our approach is to fertilize in the spring in areas we plan on cutting for hay in early May. Areas where we can’t cut hay (or simply don’t plan to) are fertilized only in the fall; this encourages the growth of clovers. On these fields, we turn cattle out early and rotate fast so the cows eat the seedheads in the boot stage. Over the years, we have found it difficult to get over all this area early enough to get the cows to eat the seedheads, so in recent years some of the pastures (about 10 to 15 percent of the grazed area) get fertilizer in the spring followed by an application of Chaparral. These areas will not have clovers (Chaparral is very toxic to clovers, possibly for several years) but will grow a lot of low-toxicity forage that we summer stockpile for use later in the grazing season. This approach has greatly reduced our need to clip pastures and gives us good-quality forage to graze during late summer. The areas we have treated with Chaparral are also shifting to forage species other than fescue, which is an added bonus in my opinion. However you approach it, working in the spring to control seedhead development in grazed pastures will pay off later in the season. We are working hard both in research and outreach programs to explore diversifying with alternative forages, including nontoxic fescue, annuals, and native warm-season grasses. Such diversification of the forage system offers great long-term benefits; however, whatever your forage system, it will pay you to minimize seedhead development in cool-season grass pastures, especially those with a lot of endophyte infected tall fescue. This article appeared in the March 2017 issue of Hay & Forage Grower on page 14.